If your like me and love Christmas so much you will love my how to decorate a Christmas tree blog post as its so easy to create a designer looking tree with a few easy steps. It’s hassle free and so much easier when you have a plan, a list and a little help on the internet! I’ve not seen this before and I’m always asked “Who did your Christmas Tree” every year without fail. So todays blog post I’m sharing all my little decorating tips with you. Plan your design. A great place to look for inspiration is Pinterest especially for colour combinations. Once you have your theme then you need to purchase the ornaments carefully. Keep to your theme and purchase wisely as it can add up. If your starting out purchase more affordable decorations and gradually replace over time. We like to add a few new decorations every year. 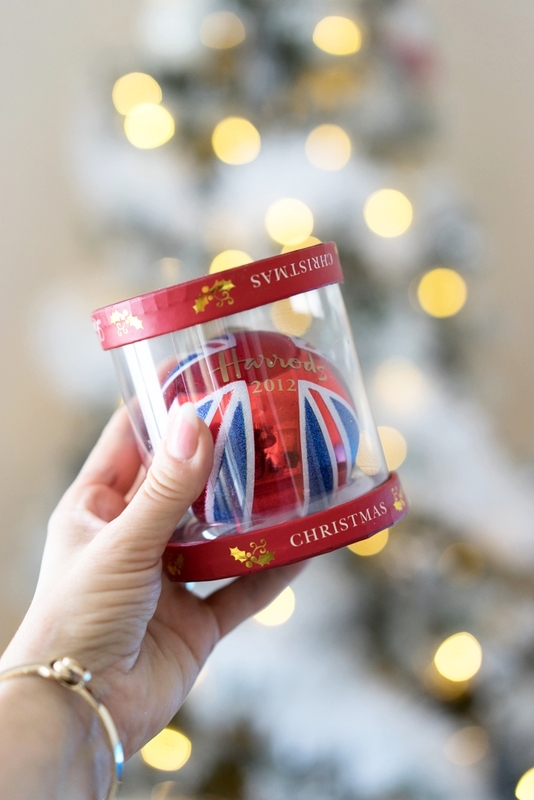 As you can see we have a very London/England themed Christmas tree and we love to pick up fun, quirky ornaments that show off our sense of humour. Decorating your tree is a time when you can have lots of fun and really make it unique to you and your family. So keep that in mind when you see something that makes you smile! The first thing to do is obviously set up your Christmas tree and get all the lights scattered equally over the tree. Or if like us we have a tree with integrated lights already added to the tree. This is a god send and save so much time and eliminates all the frustrations over tangled wires. Then the next step is to place ribbon or garlands around the tree in diagonal lines. This helps to balance the tree and also helps you decorate the tree in sections. The next step is to pile all your decorations in zones on the floor or a footstool. Divide them up into piles of similar ball balls etc. I try to have a odd number of decorations as I feel it looks nicer then having an equal amount. 3/5/7 of a similar item is easier to place on the tree. Once you have done that you need to stand back and visualise where they need to be placed. Start with the larger decorations and work in a zig zag motion. Go from the top towards the bottom and let the garlands help your positioning. Make sure you add larger decorations at the top as well as the bottom as this will create a more styled Christmas tree. This will make the tree look more professionally done. I love to place lager decorations inside the tree to add depth and this also adds a layered and more well dressed look to your Christmas tree. Then add the medium, then the smaller sized items and so on. Doing the decorations in sections really makes the tree look fluid and helps you decorate your Christmas tree evenly. Finally keep all the packaging when you have picked up some ultra special decorations as it will really help to protect your treasures until next year. The Style Bible - How Do I Figure Out My Clothing Size?